We get a lot more history on Dodge and Ellie in this instalment. Dodge kills a teacher called Mr Ridgeway, who recognises him from way back when. The cops get involved, and the detective realises that Ridgeway’s death wasn’t a suicide. Dodge gets closer to the Locke children, and finds out that they have the Head Key. Dodge kisses Kinsey. Dodge finds Duncan and removes any memory of himself from Duncan’s head. He does the same with Ellie when he is done with her. It turns out that part of him had been in Ellie’s head the entire time, and Ellie is the one who unlocked the wellhouse. The novel begins with a guy and a girl, called Callie, sitting by the river. Callie dives into the water, and the guy follows. The guy wakes up, now rather old. He’s a teacher at Tyler Locke’s school. He spots Dodge in the corridor, and instantly recognises him as someone from his past. He wonders why Dodge hasn’t aged at all in the past 35 years. Mr Ridgeway, the teacher, calls up Zack Wells’ old school. Zack Wells is Dodge’s current alias. The school have no record of him. Dodge goes to Mr Ridgeway’s house while Ridgeway is in the bath. Dodge pulls out a gun, and tells Ridgeway to overdose or he’ll be shot in the head. Ridgeway starts to fight back, but Dodge shoots him in the chest. Dodge gets Ellie Whedon to help him with the crime scene so that there is no evidence. Bode starts experimenting with his new key. The cops are at the murder scene, and one of them finds a piece of glass, covered in Dodge’s blood. The detective is clever, and realises that suicide victims don’t usually shoot themselves in the chest. Kinsey is upset about Mr Ridgeway, so Tyler and Dodge try to comfort her. Dodge gives her some pistachio ice cream. Yummy. Dodge wants to go surfing, although Tyler doesn’t really like the idea. Tyler finds a motorbike while Dodge is off finding surfboards. Tyler tries it out, and the owner catches him. The owner’s name is Jordan Gates, and she’s in Tyler’s class. Duncan leaves the Keyhouse to go to teach an art class. As he is leaving, he spots Dodge, and he recognises him from somewhere. Bode finds out what the key does. It opens up your head so you can look in there and see your thoughts and memories running around. You can also put stuff in, like dictionaries or textbooks. Kinsey looks through Bode’s head and finds the creature from the well, which isn’t a very accurate representation of Dodge’s hotness. Kinsey and Tyler take the key away from Bode. Tyler tells Kinsey to put a book in his head so that he stops flunking his classes. Duncan recalls where he saw Dodge before. When he was younger, about Bode’s age, he stumbled across Dodge and Papa Locke, and a group of friends, in a cave by the sea. Tyler shows Dodge and Jordan the head trick. Jordan runs off screaming, and now Dodge is in the know. Oh dear. Duncan and his friend go to a bar, where there is a group of homophobes. One woman hits Duncan over the head with a bottle. Kinsey takes her fear and the part of her that is always crying out of her head so she can be brave and normal again. Duncan tries to tell his friend about what he remembered previously, but his friend just thinks he’s talking crap from the head injury. Dodge uses the Anywhere Key to go to Duncan and take the memory of him out of his head. Duncan’s friend sees Dodge in the kitchen with a gun, and makes a run for it. The two women from the bar see Duncan’s friend run outside with a knife, and they panic and run him over. Dodge returns to the Keyhouse and kisses Kinsey. Dodge opens up Ellie’s head, and it’s revealed that part of Dodge has been inside Ellie’s head all along. The epilogue begins. We see Ellie from a couple of years ago, who has her evil elderly mother living with her. Her mother bullies her disabled son, and is basically a horrible human being. Ellie finds Dodge – this time as a pretty echo lady – in a glass jar. Ellie drops the jar, and mini!Dodge escapes and gets into her head. Ellie wakes up, and finds two keys on the floor. One is a key to the Lockes’ house, and is labelled with “Say my secret name”. The other seems to be the Gender Key. Ellie takes her mum to the cliffs, and intends to push her off. She doesn’t go through with it. Back in the present, Dodge shows Ellie inside her head. He takes out his mini-me, and Ellie’s memories of him. He tries to get into Ellie’s son’s head too, but there’s no keyhole. After Dodge leaves the room, Rufus, Ellie’s son, opens his eyes and it turns out that he was awake the whole time. Rufus is determined to fight back. Anywhere Key – Takes you any place you like. 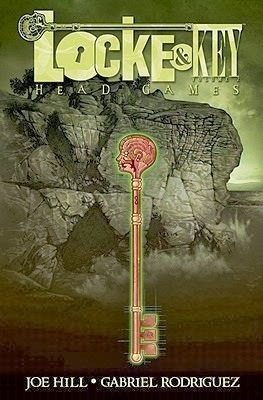 Head Key – Let’s you open people’s heads and insert or remove things. Echo Key – Lets the echo out of the well. Ghost Key – Turns you into a ghost.